ERA has a sales and marketing agreement with Rio Tinto Uranium which is based in Singapore. Under the agreement which was executed in 2014, ERA’s production is pooled with Rio Tinto’s Rössing uranium mine in Namibia and all production is purchased by Rio Tinto Uranium and sold to nuclear utility customers around the world. Uranium oxide from Ranger mine is transported by truck and rail to either Adelaide or Darwin ports and then shipped to a variety of customers in the United States of America, Europe, China, Japan, South Korea and Taiwan. Once our product is received it goes straight to a conversion plant. Impurities are removed and the uranium is combined with fluorine to create uranium hexafluoride gas (UF6), and ultimately a solid form. This is then shipped to an enrichment plant, where it is enriched and fabricated into nuclear fuel rods – ready for use in nuclear reactors. ERA adheres to Australian export laws and the nuclear regulatory framework. 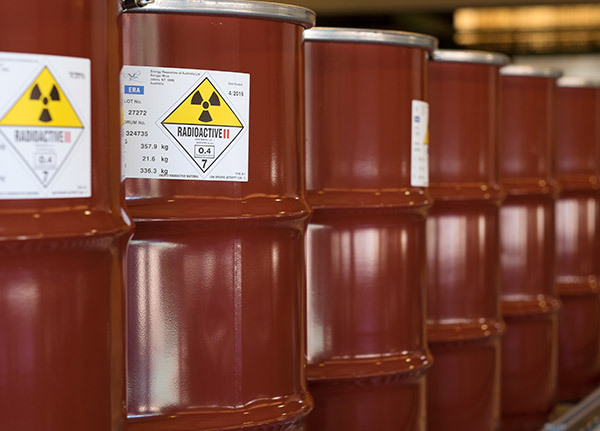 We work closely with the Australian Safeguards and Non-Proliferation Office (ASNO), to ensure that the uranium we produce for export is traceable. ERA has been reliably supplying our customers for more than 35 years. We have both long-term and short-term customers. There are different pricing mechanisms in place to optimise the value of the sales portfolio. ERA’s exposure to the spot price is reduced by an emphasis on long-term contracting in order to capture the highest market value for its product. The average realised price achieved in 2018 was US$47.67 per pound representing a US$23.08 per pound premium to the spot price.